Sometimes, I don't understand Tillerman at all. 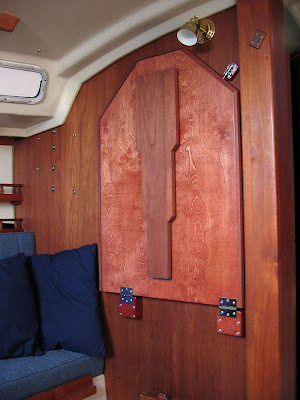 What is all this noise on his blog about furniture and tables and sailboats? He claims some badass retailer that sells, of all things, drop leaf tables asked him to write a post named, well... 'Drop Leaf Table'. That is confusing enough, especially for a blog ostensibly about sailing, but he goes on to say he couldn't just write that post about drop leaf tables. He would have to gradually work up to it. He has been gradually working up to it for a week, posting ten separate posts about tables, beds, guitar-shaped boats, and furniture. I say, if you're going to write about drop leaf tables, just man up and do it. By way of example, this is a post about a drop leaf table, and it's even related to sailing, sort of. Here is my drop leaf table. OK, OK, let's not argue that this is technically a drop down table. Drop down, drop leaf - close enough for me. I am rather proud of my drop leaf table. It is not a great work of carpentry, but I made it with my own hands and for me, that alone is quite an accomplishment. 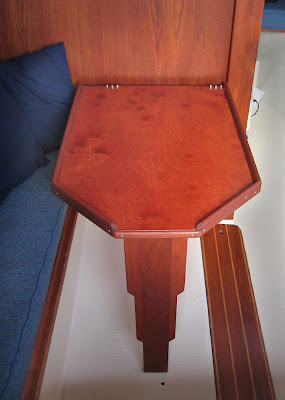 Anyone who has a Catalina 30 will know why I took on the task of making my own drop leaf table (see, I'm sticking with 'drop leaf' for the rest of this post). The makers of the Catalina 30, bless their sweet hearts, were faced with the same problem that has confronted most makers of 30-foot coastal cruising boats. How do you fill in the settee so it will convert to a double berth for sleeping and yet still provide a table in that same space for when you're not sleeping? Alright, I know this is pretty boring, but, somehow, I need to prove that you CAN write a blog post about drop leaf tables. Since the Catalina 30 is what's called a 'price boat', they took the cheap and easy way out. They started with a plank of particle board, slapped some ugly plastic laminate on it, made it big enough to fill in the settee for sleeping and then stuck a flimsy little folding leg on it for converting that into a table. Voila! Now it's a double berth, now it's a table. The problem is that a slab of particle board that's strong enough to support two sleeping people has to be pretty thick. And a slab of particle board that big and that thick ends up weighing about 800 pounds. And when you want to convert from berth to table, or vice versa, you have to pick up the whole freaking thing and wrestle it in and out of two tiny brackets. If you want to stow it away, you have to flip the whole thing over at the same time. It's almost impossible to do that without needing a chiropractor afterwards. So, I decided to improve on things. I gave up on using the settee as a double berth and decided to just make a table big enough for two people that would easily fold out of the way for storage. Most well-made boats have a nice table that folds up against the bulkhead, so how hard could it be to make something like that? Plenty hard, as it turns out. 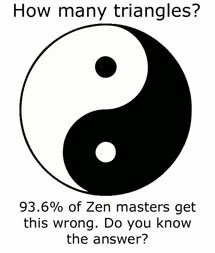 It took me about six months to find out just how hard. Now, this not being a blog about furniture making and me not being anything remotely like a carpenter, and since anyone still reading this must be half asleep by now, I will dispense with the details of actually making a drop leaf table. Suffice it to say that fitting into a boat something like a folding table that works in both its 'deployed' position and stows away neatly in its folded position without banging into or scraping against a dozen other things in the boat and that stays down when its supposed to be down and up when it's supposed to be up and does all of that when you're sailing or not sailing is quite a bit harder than I ever imagined. It has something to do with being able to think in three dimensions to build such a thing and me having trouble just thinking in one dimension at a time. God knows how they design the important stuff on a boat that has to move and yet still be able to work in all different conditions - things like sails and booms and rudders. It must be even harder to make stuff like that than it is to write a blog post called Drop Leaf Table. Nice cushions. You should write a post about cushions. I mean, what sailor really wants to read about drop leaf tables? I just did this to prove that such a post could be written. Ah, but cushions! All sailors have to suffer through the infamous cushion overboard drill. Cushions have a special place in the heart of every sailor. Who wouldn't want to read a post about that? Exactly. I don't understand why you guys who have boats that carry around all that furniture all the time don't write about the furniture more often. I mean, if you don't think furniture is interesting why did you buy a furniture-carrying boat? Or maybe you could write about the cooking utensils or the mattresses or the head? We Laser sailor bloggers just don't have the same opportunities for subjects that you furniture boat bloggers do. Nice job on the table, O Docker. I'm impressed. Throw pillows are also important when sailing around with all our furniture. They can be brought up into the cockpit so our backs don't get sore from the coaming. And the dog will have something to rest her head on. My wife is in charge of the pillows. Pillows are a lot more important on a boat than many people realize. My wife says they are needed to make the boat feel more 'homey' (I think she means 'homey' in the mid- 20th century sense, not in the late 20th century sense). If it weren't for the pillows, I would be sailing by myself a lot more than I do. Don't forget the area rug for the cabin sole. It and the pillows can be found cheaply at Tar-zhay. The rug, how we came to select it, and what we had to go through to actually get it, is a whole other topic, probably worthy of its own post. Maybe Tillerman's right. There's a whole world of boat furnishing and outfitting that board sailors know nothing about. This is all tightly intertwined with the delicate matter of spousal approval. At one point, the success of an entire sailing season hinged on the proper selection of a space heater. I wonder if Tillerman has ever had anything on his Laser dry-cleaned? It's amazing that after all these years, Laser couldn't have implemented a more effective bailer, like the good, old-fashioned (there's that phrase again) Elvstrom bailer. Yeah, the metal bale can get bent if you step on it, but eventually you learn not to step on it. I can still that slurping sound! 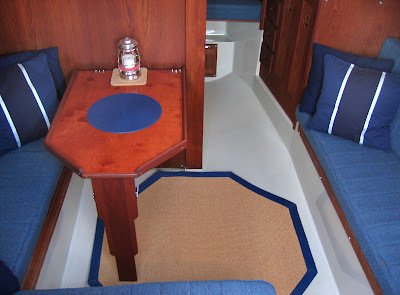 We don't have a drop-leaf table on any of our boats. Do we suffer from drop-leaf boat table envy? Should our next boat have a drop-leaf table? Will Tillerman's special store make a drop-leaf table to fit our next boat if it doesn't come with one? However, we are beginning to have a few drop-leaf trees. In many respects, a drop-leaf tree is nicer than a drop-leaf table. Surely, you can't hang a swing from or build a tree house in a drop-leaf table. But you can do that, and many other things, with drop-leaf trees. Pat, I tried looking at the CSN site and was overwhelmed by the bewildering array of product categories, but couldn't find one for Etchells Drop Down Tables. I guess I need some help using their search feature. Baydog, my old sailing dinghy had what the boat maker called an 'autobailer'. I was new to sailing and came to understand that an autobailer is what you use when you want to flood the cockpit. I don't know - is that for washing your feet? I got tired of having all that water in the cockpit, so I stopped using it. They worked alot better in the E Scow than in the Penguin. It's a speed thing. Yarg has the ultimate solution for leaking autobailers. Pat and I once chartered a Beneteau that had a true drop-leaf table -- it had a stationary center section, and a drop leaf on either side, so people seated on both settees could dine off it. As a bonus, the center section of the table had a wine rack underneath. You can buy a wine rack at CSN Stores. Enter the contest on Proper Course and win a $75 gift certificate. Is there a drop-leaf table for the MacGregor? Maybe that's what we need to make it sell. We didn't have cushions for the crew overboard drill years ago when we took Keelboat 101. But we did have sea lions very much involved.